Great pub, helpful, lovely owners and staff - they took over a couple of years ago. Nice selection of beers. Dog and childfriendly, nothing too much trouble. Food was delicious, and beautifully made/cooked. Prawns tasted so fresh they must have been caught that morning. Lovely old, clean and spacious interior, plenty of atmosphere and tables and lovely back garden with outdoor seating. Just off the A22, great spot for lunch. A short walk to Westbere Marshes. Will definitely be back. Visited for the first time in about a year and a half and the new owners have done a good job on this place. Great food, a great pint of Harveys, friendly people and the sun was even shining (guess that's not a given). Bags of character - will go back. This pub is such a lovely find!! It's tucked away in the prettiest of villages and it feels like you step back in time taking the turn off from the A28. We were looking for a quick stop pint somewhere we hadn't been before, but ended up having a fabulous Sunday roast beef too. If we hadn't had a huge late fry up for breakfast we would have sample the whole menu, that's how good it looked. The staff were most welcoming and we will definitely be back for more, this time with an empty stomach! This is a lovely little pub in a beautiful village. It has been deserted each time we have been, which seems a little odd. The food was worth the wait...(we did wait some time considering we were the only ones there when ordering). It seems a shame that not more people use it. 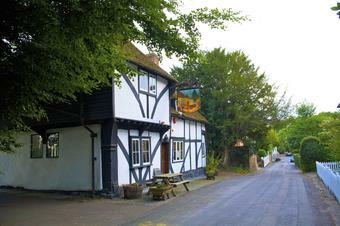 We love this pub - great food, good beer and wine and the atmosphere is lovely. A real gem for both locals and visitors alike!